As a graphic designer, do you design for the client or for yourself? I don’t think your magazine fonts are small enough. I can still read your magazine if I use a magnifying glass. Could you please make the fonts even smaller, preferably so they are no bigger than the period at the bottom of this question mark? Is it possible for you to switch to a font size of 1? EDITORS RESPONSE: Why yes, yes we can make the fonts smaller! How about this; is this small enough for you? You should talk to Bob Cohn, our executive editor. His pet peeve is when we run tiny white type on a silver gray background. Only 16-year-olds can read it. We call it “Bob gray.” He hates it so much he quit.—Ed. Their response in the print version is in a 4 pt italic serif typeface with 6 pt leading (I still own a type gauge from Compugraphic so I can check these things – I am thinking of donating it to the Smithsonian). 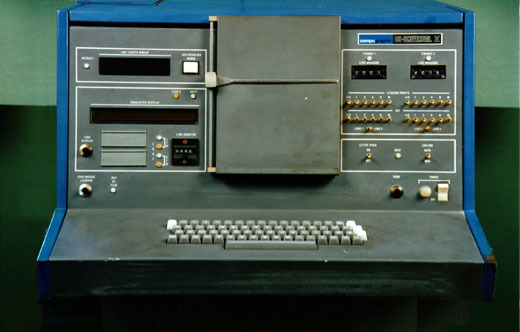 A Compugraphic Editwriter typesetting machine. I agree with the Wired editor who complains about type only 16-year-olds can read. Design is about communication, especially if your client or boss is paying you to share their message with their audience. If what you put on the page (or screen) doesn’t serve this function, then you are only concerned about satisfying your own ego.